Single line parafoils are frameless kites that have no sticks to break and no adjustments to make. They pack into a small bag, making them the portable, take-anywhere kite. Parafoils are great for bikers, hikers and anyone on the go. 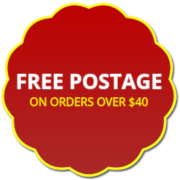 FREE Postage if you spend $40.00 or more. Orders of less than $40.00 will incur a fixed postage and packing charge of $6.00. All kites shown below are in stock unless marked otherwise.